Category 1, 3, 4 and 5 Gents and visitors are debarred from starting at any point on the course between 3.40pm and 6.15pm on a Tuesday with some exceptions as listed below. 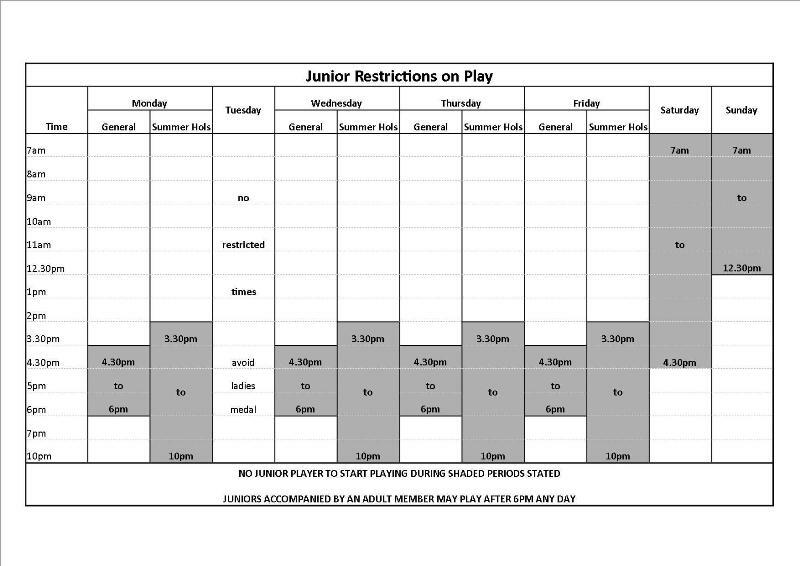 Category 2 members and visitors are debarred from starting at any point on the course between 4.30pm and 6.00pm on Monday, Wednesday, Thursday and Friday and cannot play at any-time on a Saturday. Category 6 and 7 members and visitors are debarred from starting at any point on the course between 4.30pm and 6.00pm on Monday, Wednesday, Thursday and Friday even in the company of an adult. These categories may play on a Sunday after 12.00 noon. During the main school summer holiday they may not tee off after 3.30pm on weekdays. The exemption to this is when category 6 are in full time employment and have recieved written permission from the Golf Executive to play after that time. i) Ladies who play during a Saturday competition will play under competition conditions from the ladies tees in their own competition. ii) The Golf Executive will publish a list of Saturday events when ladies can play. iii) Ladies can append their name to the list of players for inclusion in the ballot in the same way that Gents do by joining the queue either on a Sunday (12.00pm) or on a Wednesday (4.00pm and 7.00pm). If spaces are available during the Ladies competition on a Tuesday night between 3.40pm and 6.15pm Category 1,2,3,4 and 5 Gents can play. However, these free spaces can only be used to play a club match play tie. Spaces must be booked in the Professional's shop up to 6 days in advance. No queuing at the 1st tee will be allowed during this time.